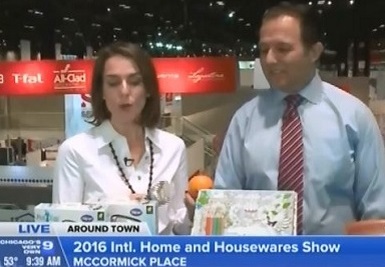 The annual International Housewares Show (March 5 – March 8th) in Chicago was bigger and better than ever as companies from across the globe came to show their wares to the retail world. And this year, TeleBrands had a huge presence at McCormick Place with a brand new booth and a whole lot of hot new products to show off! TV infomercial personality, Cathy Mitchell showed off some of the hit TeleBrands products she represents like her best selling Crock Pot DumpMeals book and the all-new Red Copper non-stick frying pan. Other TeleBrands sellers on display were Star Shower, the holiday laser display light, and the series of Colorama books created for relaxing while reducing stress.